• Put the Logo on your sidebar, or within a post. •Link the nominees within your post. •Let the nominees know they have received this award by commenting on their blog. cant wait to get my list started :)!! Truly, this blessed my heart. I had such a lovely visit looking through your blog. I love the play of sunlight in your previous post. The journals you made for your daughter and friends--what a beautiful gift for a retreat! It reminded me of something I'd like to make for my Bible study ladies. Thank you for the nudge. HELP! I need some guidance in blog world! 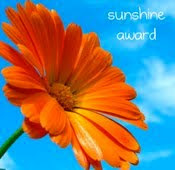 Renee, Thank you for including me in your list of Sunshine Award winners! Thank you for the sweet award. How nice of you. I'm sorry, but I don't do awards on my blog, but I do appreciate your thoughtfulness. Thank you so much Renee. Your blog also will be on my list of 12 blogs that make my day. I'm so glad that I've found it.